Seems like everyone is affected by the credit crunch . . . I'm in transit now till Friday when I'll be back in Bristol and looking forward, I guiltily admit, to a bit of good old English drizzle. Another salad. It's so hot here (in the Languedoc) I can't get my head round making anything else. Hot too in London, I gather, so maybe you'll enjoy this recipe which comes from my veggie student cookbook Beyond Baked Beans Green. It's a spin on the Middle Eastern spread Baba Ganoush which I love but which I never think looks too great - a sort of khaki-coloured splodge. This basically uses the same ingredients but turns them into a salad that can be served with grilled or leftover lamb or, more frugally, with feta or with other mezze which is how we've having it tonight. Cut the stalks off each aubergine, cut in half lengthways then cut into cubes. Heat a wok for about 2 minutes over a high heat, add the oil, heat for a few seconds then tip in the aubergine cubes. Stir fry over a moderate heat for about 5 minutes until lightly browned then turn the heat down low, add the onion and garlic, stir, cover the pan and cook gently for a further 15 minutes, stirring from time to time to stop it catching. 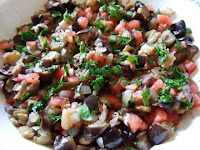 Tip the cooked aubergine into a shallow dish while you prepare the other ingredients. When the aubergine is cool (about 20 minutes), cut it up roughly with a knife and fork then mix in the chopped tomato, parsley and mint. Season with the lemon juice, cumin and salt and pepper and serve in any of the ways suggested above or simply with warm pitta bread. The key to this simple salad, which I got from a French friend several years ago, is frying the onion well as it providea a really flavourful base to the rice. Frugal and delicious. Heat the oil in a saucepan, add the chopped onion and fry over a medium heat for about 5-6 minutes until the edges of the onion are beginning to turn dark brown. Tip in the rice, stir then add the water and stir again. Bring to the boil, put a lid on the pan, turn the heat down and cook until the water has been absorbed (12-15 minutes). Turn off the heat and leave another 5 minutes. Meanwhile skin the tomatoes by nicking the skin near the stem with a sharp knife, putting them in a bowl and pouring boiling water over them. Leave a minute, then drain and cover with cold water. The skins should come away easily. Roughly chop the tomatoes. 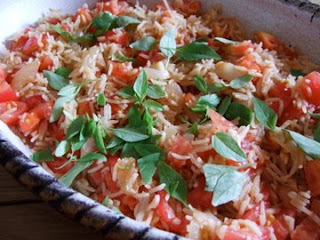 Spread the rice out in a shallow dish and leave to cool for five minutes then add the chopped tomatoes. Season to taste with salt, pepper and a few drops of wine vinegar and mix well. Just before serving add a couple of heaped tablespoons of torn basil or tarragon leaves and toss the salad again, adding a little extra olive oil if you think it needs it. Best served at room temperature. (Particularly good with grilled chicken). Now that the credit crunch is really beginning to bite and that there are fewer customers around spending less we're beginning to see more special offers in restaurants. The excellent moneysavingexpert.com lists a whole lot of deals in the restaurant section of its website which is worth checking out. For example Marks and Sparks has got an 'eat out at home for a tenner' deal running from tomorrow (24th) to Sunday (27th July) while Yo Sushi is offering 50% off food bills on Mondays and Tuesdays until August 19th. If you're after a bit of high end eating and have time to spare during the day you'll always find better deals at lunchtime than you will in the evening. In London, for example Tom Aikens, a restaurant I really rate, offers a three course lunch for £29 whereas the evening tasting menu costs £80. Claude Bosi's Hibiscus, another restaurant tipped by Michelin last year as a 'rising two star', goes even better with a lunch menu for £25 (evening £75). Shame the business lunch is dead and buried . 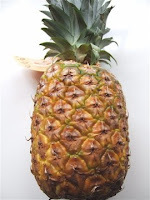 . .
Why isn't pineapple more highly rated? You rarely find it in restaurants. Maybe it's the traditionally naff uses that people make of it. Cheese and pineapple sticks (though they are actually delicious made with decent cheddar and fresh pineapple). Ham and pineapple pizza (never been a fan . . . ). Pina colada? Pretty tacky made with pasteurised pineapple juice but, again, great with fresh pineapple. What better finale can you think of for a spicy meal than some finely sliced fresh pineapple, served with a fresh lime and chilli-flavoured syrup or a drizzle of kirsch or white rum? Maybe it's because it's fiddly to prepare but not THAT fiddly. All you have to do is cut it in thick slices, cut away the skin and the central core and cut it into chunks. No more difficult than a mango and everyone's crazy about mango. I've been breakfasting on it all week and would have made this fabulous smoothie I found on an old Waitrose cookery card (from the days when I used to shop at Waitrose ;-) if I'd had more time. I love the way it's topped with just-melted vanilla ice cream. Are you a pineapple fan? 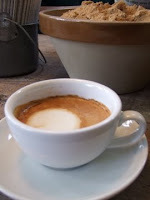 Is this the best value coffee in London? Unlike many espressos it wasn't remotely bitter or over-extracted, just a pure, fragrant coffee flavour. Eat your heart out, Starbucks . . .
Just in case you wondered if they were mouldering away in the veg rack I used a handful of the green stalks to make a green onion and goats cheese omelette a bit like the wild garlic and chervil omelette I made a couple of months ago and used the rest to make this tasty green onion soup. I've had a bizarre 48 hours moving from Arles in Provence back to the Languedoc then flying home to Bristol yesterday, in the process experiencing a couple of thunderstorms and a temperature drop from 33° to about 14°C last night. Two aubergines had bitten the dust, I'm afraid to say, but I salvaged a couple of big red peppers and beefsteak tomatoes and some gorgeous sweet onions that they sell by the bunch at this time of year. I cut them up and roasted them in a moderate (about 180°C) oven, Elizabeth David-style with slivers of garlic and lashings of olive oil for about an hour and a quarter until they were all sweetly caramelised then left them to cool. We ate some for supper, dunking chunks of fresh baguette in the gorgeous garlicky oil then I left the rest for my husband to pick at while I'm away. They make a great addition to sandwiches or you can add pasta to them for a pasta bake. No sooner had I got back, of course, than I had acquired more veg in the form of this fabulous bunch of onions I picked up from an organic food stall at the Bristol Wine and Food Fair. Not wholly sensible as there's only me to feed but they were irresistible. I think maybe a green onion soup with beans would be good. It's certainly cold enough for it. Topically the UKTV website has put up a list of 50 budget recipes on its website today, a useful resource for anyone trying to trim their household budget. There are a couple I wouldn't myself regard as particularly thrifty. Spaghetti vongole made with fresh clams isn't cheap unless you live by the sea - or in Venice - and the compilers of the list obviously haven't noticed how much lamb shanks have gone up in price recently but I like the idea of the Turkish chickpea stew Inzimino, Afghani aubergine casserole and James Martin's clever Instant Banana Icecream. I hesitated about posting this because it's nothing to do with frugal eating but I've just discovered this photographer whose work I think is amazing. His name is Tim Walker and his work has a fantastical Alison in Wonderland quality - plants grow all over bathrooms, beds turn up in fields, trees sport dresses like hanging lamps, a chandelier is turned into a ring of ice cream sundaes . . . He's mainly a fashion photographer but occasionally tackles food. His work is being displayed at the Rencontres Arles an annual photography festival in Arles to which we've been coming for the past six years as our youngest son, Flyn, is a keen photographer. He's especially interested in this years' exhibits which have been curated by the fashion designer Christian Lacroix (who comes from Arles) as he's doing an MA at the London College of Fashion next year. Anyway back to Tim Walker. For some strange reason he hasn't got a website and I obviously couldn't snap any of his pictures for copyright reasons but have just discovered he's got an exhibition on at the Design Museum in London this summer which is on till September. If you're interested in photography do go. Where to store fruit and veg? I've just written a piece for my student website Beyond Baked Beans on how to rescue the foods that tend to get chucked out most often - 40% of which are accounted for by fresh fruit and veg according to WRAP, the government-backed organisation which tries to make us more waste-conscious. Basically they reckon you should keep all your fruit in the fridge and obviously there's a lot to be said for that in terms of extending their useful life. But the fact is that I generally don't because I think it dumbs down the flavour and so much fruit (and veg such as tomatoes) is not fully ripe when you buy it. I suppose it depends what kind of cook you are. If you're conscious of the ingredients around you on a daily basis you can probably afford to leave them out. If you're short of time or live the kind of life where you're constantly changing your plans it's probably safer to refrigerate them. Should Gordon be bossing us about? 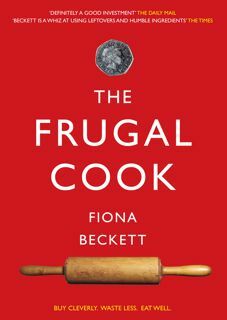 I was amused to read today that Gordon Brown was telling us to be more frugal and not to waste so much food. He's absolutely right, of course, but is it the PM's job to tell us how to run our households? The fact that his involvement is controversial is all to the good - the media have all picked up on it. Those who hate the idea of the 'nanny state' will object vociferously. Those that think that it's time we all addressed these issues will approve. I was going to submit a recipe from my recent post 4 days eating from one chicken but then I remembered the best chicken recipe of all - and the perfect one for this time of year - Beer-can Chicken. When I discovered this last year I just couldn't stop making it. It's that rare recipe which is simple and delicious and fun to make. A real show stopper. Basically it's a chicken barbequed over a half empty beer can. The steam from the beer keeps the flesh moist while the (admittedly rather undignified) position the chicken is in keeps it basted and the skin beautifully crisp. You also need a barbecue with a domed lid. The peaches are so luscious here in France, so ripe they literally fall apart in your hands. And so cheap! I'm using them every which way I can. My favourite start to the day is a peeled peach, roughly cut up and mixed with plain yoghurt. You're lucky if you can get peaches that ripe at home of course but you do occasionally find them. And if you can't you can easily substitute less ripe fruit, cooked with a little sugar or honey until soft. Apricots, mangoes and plums are good this way or you can mash up some strawberries or bananas and fold them into the yoghurt. I always buy plain yoghurt (cheapest in big tubs) rather than fruit flavoured ones in which the fruit content is generally negligible. I remember checking out childrens' yoghurts for a book I was writing (The Healthy Lunchbox) and finding that some contained as little as 1% real fruit. And loads of sugar. You can also whizz up ripe peaches with milk to make a fabulous topping for cereal my friend and fellow blogger Signe of Scandilicious told me the other day. For two servings she says you should whizz up four ripe peaches (peeled and cut up) in a blender with about 350-400ml of milk and a pinch of cinnamon or ground cardamom. Use it straightaway or it will separate. If you whizz it with ice cubes it also makes a brilliantly refreshing drink. When it's hot, as it is (steamingly . . . ) right now in the south of France, I really don't like to cook that much so the best thing is to prepare food while it's still relatively cool and eat it at room temperature. Cooked vegetables like this lend themselves perfectly to this treatment and make a nice change from conventional salads. You can serve it, mezze style, as part of a selection of cooked vegetable dishes, with feta, goats' cheese or hummus or as an accompaniment to grilled chicken, lamb or pork. Trim the ends off the courgettes, quarter lengthways then cut into thin strips (see pic above). Heat a large frying pan and add the olive oil then fry the courgette strips for about 10-12 minutes until soft and lightly browned. Add the garlic for the last couple of minutes then turn off the heat and stir in the mint. Tip the courgettes into a shallow dish with their oil which goes a beautiful emerald colour and leave to cool for 10-15 minutes. Add 2-3 teaspoons of vinegar or lemon juice, season with salt and freshly ground black pepper and toss together.